It’s a strange thing, watching history. 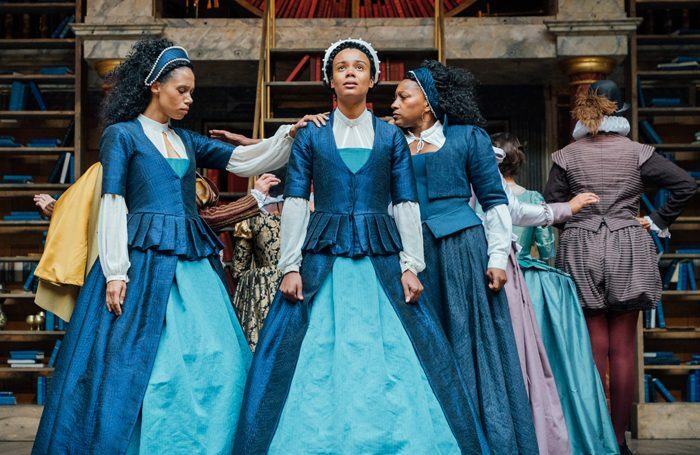 But that’s exactly what the final performance of Emilia felt like, standing in the yard of Shakespeare’s Globe while the cheers rang out for encore after encore, all tears and hugs and a feeling, distinct and yet somehow universally shared among the assembled, some of whom had returned for third, fourth, and even fifth viewings. A feeling that something had happened, or rather, was about to begin. I am not equipped to articulate the significance of this play. Neither am I equipped to articulate the significance of what it might mean for women, people of colour, the differently-abled and, more generally, the marginalised voices of history. Far better (and more capable) writers than I have already done so. Besides, one need not look very far for these opinions – just search #Emilia on Twitter. 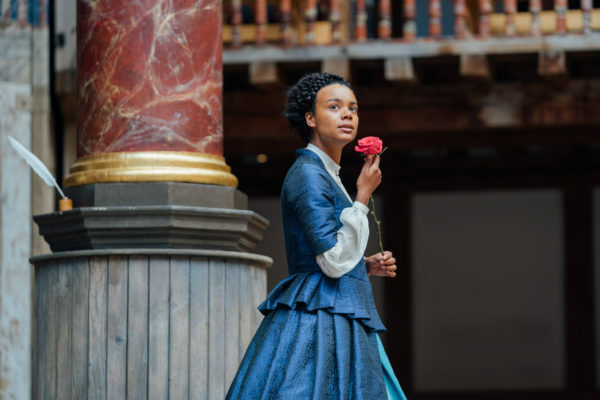 What I can do however, is articulate how well Emilia succeeds as a play, a performance, and a production. And reader, Emilia exceeded in all three. Emilia Lanier (née Bassano) was a poet of the Elizabethan era, the first Englishwoman to publish as such, and a possible inspiration (or originator) for Shakespeare’s work – namely as the ‘dark lady’ of his sonnets with dun skin and black hair. Written by Morgan Lloyd Malcolm and under the direction of Nicole Charles, the play tells Emilia’s story and struggle to assert herself as an artist and woman, and does so with heart and humour, passion and purpose, and endless, joyous invention. Morgan Lloyd Malcolm’s script perfectly captures the language of the time for a modern audience, making excellent use of period detail and gleefully knowing, anachronistic humour. Despite its historic setting, the play is freshly relevant to our times, not least for its subtle yet effective discussions of immigration, race, and female agency. In relating the past to the present day, the play smartly and subversively questions how far we really have advanced as a society when such issues remain unsolved. The ensemble cast are a delight to behold. The performers bring life to a vast array of personalities both tragic and comic, from dedicated heroines (Leah Harvey, Vinette Robinson, Clare Perkins), courtiers both sleazy and affected (Shiloh Coke, Carolyn Pickles, Sophie Russell, Amanda Wilkin) and of course, Shakespeare himself (Charity Wakefield), wonderfully imagined here as an insufferably self-important oaf. Why heroines and not heroine? Well, there are three Emilias in the play, all representing various stages and ages of the poet’s life. To use three people to play one character (often simultaneously) could easily be awkward and confusing. However, Nicole Charles’s creative direction blends the performances seamlessly. We are not just watching Emilia at different stages of her life but also Emilia in different states of mind – the determined, the despairing, and the defiant – and sometimes all at the same time. Credit must also be paid to the production team for creating a world of sound and colour that feels both imminently real yet undeniably magical. The music, as composed by Bill Barclay and performed by Elinor Chambers, Calie Hough, Sarah Humphrys and Sharon Lindo, evokes the time and place yet carries with it mystery and promise befitting Emilia’s tale, while Joanna Scotcher’s costuming is exquisite and charming, with meticulous attention to detail. One of the real stars of the show is Scotcher’s set. The design conjures images of an enchanted library, a sacred space of learning and actualisation so often denied to women throughout history and completed here with a circular portal that could well represent an opening to the world of the past, the mind, and maybe even the future – one in which women might be truly free to create, to love, and to be. Emilia is not history rewritten, but history relived. The play is the rarest of achievements, a work that serves as more than its writer, director, cast and crew. Emilia sings, shouts, and screams with the voices of generations stretching back into the past and outward into the future – an echo through time, and a call forward, forward, forward.